In 1910 a rather interesting book was published Un libretto di Alchimia su lamine di piombo nel secolo XIV, edited by Angelo Marinelli. It concerned an alchemical book of lead pages in the library of Professor Scipione Lapi. This volume consisted of 36 rectangular shaped pages of lead sheets about one millimeter thick. These had inscribed on them text in Italian and Latin and thirteen emblematic images. Although the author of this book thought the lead book was from the Fourteenth century, the historian of science Carbonelli, in his seminal work published in Rome in 1925 Sulle fonti storiche della Chimica e dell'Alchimia in Italia (On the historical sources of Chemistry and Alchemy in Italy) established by comparing it with another lead codex, preserved in the Diplomatic Fiorentino, that these were more likely to have been created in the Sixteenth century. There was a tradition of creating lead codices in Italy at that time. Sadly this lead codex can no longer be found, but in his book Marinelli had printed some drawings of the thirteen images and transcribed the text. We will look here only at the third one which is of an hermaphrodite. The text below it states - I am the first matter of the wise. 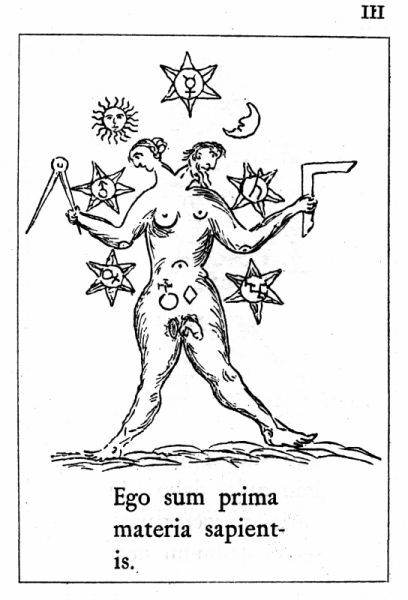 The hermaphrodite is surrounded by the seven planets and the female side holds a set of drawing compasses, while the male side holds a set square. An image similar to this was created as a woodcut illustration to Franz Kiezer's Cabala Chymica of 1606 and a few years later, 1610, in the fifth emblem in the Valentine Azoth series. In one hand he held a compass, in the other a carpenter’s square. As he went wordlessly past me, toward the ball, he grew ever taller and larger, until the ball reached only to his belt (although it was really higher than a house) and his head reached to the Sun. Then he set his compass in the center and circumscribed the ball, so that it became perfectly round. After this, he placed his compass on the carpenter’s square, and spoke. “It is one times three multiplied by itself.” Then he placed the compass again on the top of the ball and measured the distance from this to the firmament, and again from the firmament to the highest Star. He cried with a terrible voice, “This is one out of four separated by the three.” Next he drew two lines from the uppermost star to the ball, such that they intersected one another, so that a triangle was formed. 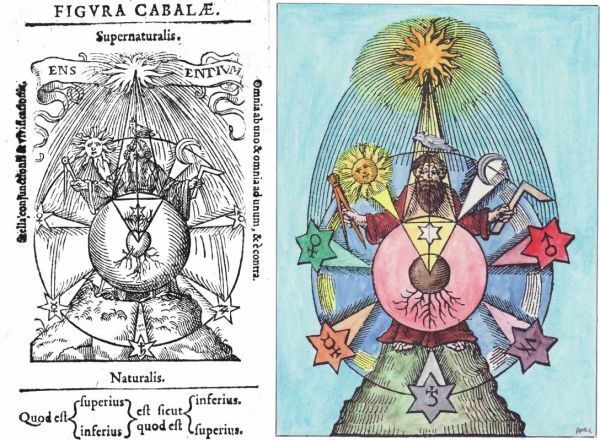 After this he made a quadrangle from the center with the compass, such that one corner was at the center of the ball, and a white dove sat on the opposite corner, which he called the Spirit of the Conjunctions and the Vivifactions.